The Cathedral Choir consists of about twenty boy choristers, six probationers (who will become choristers) and fourteen gentlemen, both lay clerks and choral scholars. It sings at five of the weekly services and on all the major feasts and Holy Days as well as giving regular concerts both in the Cathedral and within the Diocese. The choir sings an exciting and challenging wide repertoire, encompassing the full range of Roman Catholic music from Gregorian chant to the present day, as well as music written for the English Church, and music of other Christian traditions. The Choristers are chosen by audition and all receive an outstanding education at the Cathedral’s choir schools, Runnymede – St Edward’s School (until the end of Year 6), and (from Year 7), St Edward´s College. Here there are morning rehearsals to prepare the music of the weekly services and for many other special services and concerts. The boys also carry out their normal school activities, both academic and extra-curricular, as well as receiving vocal and instrumental tuition. Many former choristers have gone on to pursue professional musical careers. 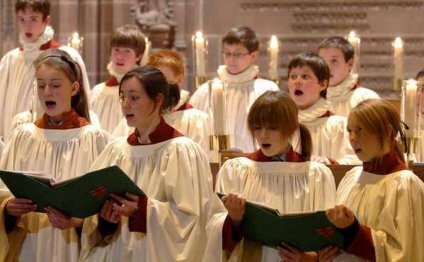 As well as its significant role within the working life of the Cathedral, the Choir is active within the Archdiocese and the City of Liverpool, singing at many civic, ecumenical and academic services. Broadcasting regularly, the Choir has sung many times for both BBC television and radio and independent broadcasters and has also made a number of recordings. Singing away from home since the 1970s, tours have included Belgium, Spain, Holland, Hungary and the USA and Canada as well as many cities within the British Isles. The Choir first sang at High Mass in the Lutyens Crypt under the direction of the first Master of the Music, Christopher Symons on the titular feast of Christ the King in 1960, celebrating its 50th birthday on this feast day in 1960. The Cathedral Choir has been supported over many years by the Friends of Cathedral Music and has received over £37, 000 towards various projects, most recently in 2014 for the provision of new music desks and benches in the Song Rooms. The Girls’ Choir was founded in 2008 to extend the musical opportunities enjoyed by boys to thirty girls aged between 11 and 16. The girls also receive specialist music places at the senior Choir School, St Edward´s College. The choir sings at Mass on Mondays and Choral Evening Prayer on Wednesdays, as well as participating in a wide range of concerts, in Liverpool and further afield. The Cathedral Junior Choir accepts boys and girls from the age of 7. It meets to rehearse regularly throughout the academic year on Tuesday evenings and has the responsibility of assisting with the music of the liturgy for the Sunday Family Mass in the Crypt Chapel, at which the choir sings twice a month. Consisting of up to 40 members, the Junior Choir has a varied repertoire which ranges from contemporary sacred music to youth-oriented popular songs which demand the need to sing in harmonic parts. Entry to the Youth Choir is restricted to former choristers of the Cathedral in Years 10-13. The Choir rehearses once a week at the Cathedral and sings at liturgies in the Cathedral and elsewhere.